When the afternoon sun steals away behind the cliffs and the last ferry pulls away from the pier, all of Positano begins to exhale and the most beautiful part of the day begins. The blue hour arrives, as the last bit of gold dissolves, and lights appear on the water as fishing boats find their way home. The last customers leave the store as shop owners turn off the lights one by one...by one. Quiet your steps in the street and listen to the muffled conversations of the day, the rattle of pots and pans through open windows of kitchens preparing dinner. Breathe in the aromas that escape and carry you down the alleys to find its source. The silent streets beg you to follow them.... down, around.... just a little further to see what's around.... the next corner, and the next. The darkened street corners hold tightly to secrets we'll never know as we walk past on our way home. 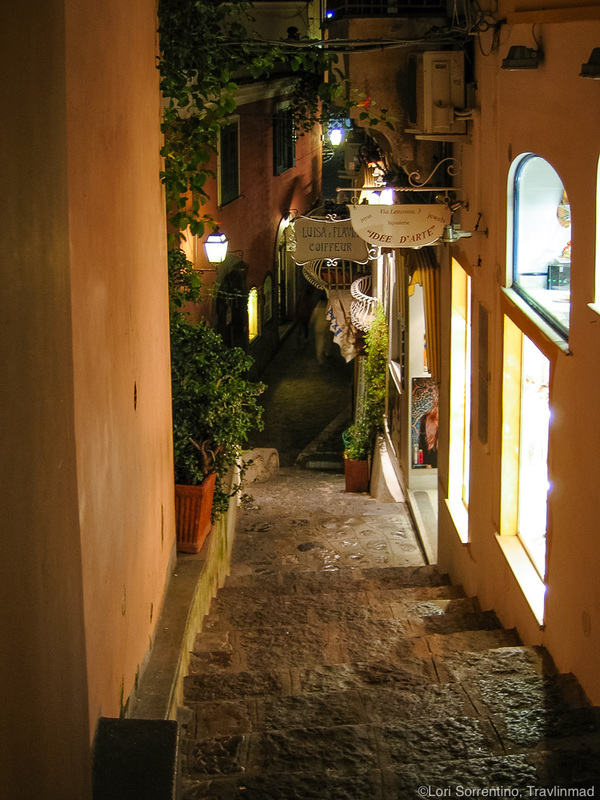 Stay lost for awhile in the beautiful stillness in the streets of Positano.... listen for the haunting whispers of ancient souls who pass you by. Buonanotte, beautiful Positano, and sogni d'oro... sweet dreams.